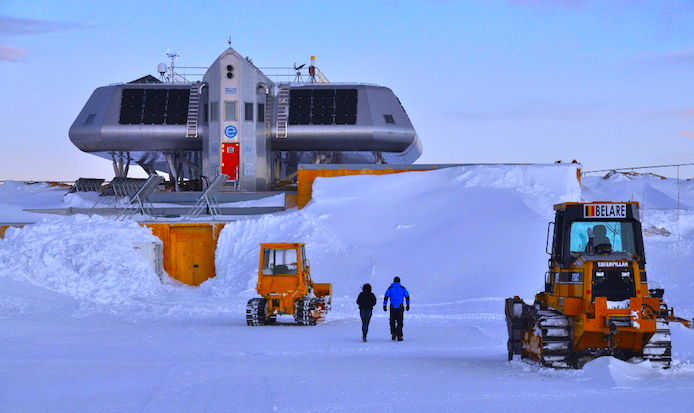 The 2017-2018 scientific season at Princess Elisabeth Antarctica research station has begun. This is the 14th Belgian Antarctic Research Expedition since the project to build the Princess Elisabeth Antarctica began in 2004. Alain Hubert and his crew have been preparing the station for the first group of scientists who have just arrived in Antarctica, glaciologists and specialists in atmospheric sciences, some heading for the Roi Baudouin Ice Shelf. ​The Princess had been sleeping over winter, but everything was ticking-over and on-line, purring along on the energy harvested from the wind and the sun. Mission one is snow clearance. The barricades erected by the wind around the Princess are removed. After a very long dark cold winter in Antarctica, the snow has accumulated and the entrance has to be cut free to allow the garage to be opened and snow tractors to come out and start the spring cleaning. The crew will clear the hard packed ice and snow using Prinoth and Komatsu vehicles stored at the station during the winter months. Now the princess is ready for human occupation and is in full operational summer mode. The expedition this year is truly international and nearly a dozen countries are represented, some for the very first time. The excitement and energy is palpable. Even seasoned researchers are apparently so excited that they cannot sleep. Antarctica beckons. Princess Elisabeth is located in a pristine part of Eastern Antarctica. The Station is surrounded by a wide variety of research environments, from mountain ranges jutting out of the ice sheet, to wide dry valleys, huge ice fields and icy cold freshwater lakes that are almost always frozen. The research potential for this region is immense and new discoveries lie in wait for curious minds. Princess Elisabeth offers scientists a wide range of technical and logistical services. The support they receive from the station crew is provided by numerous specialists on site to help with tasks ranging from field deployment, to communication and equipment electronics failures, or to help build impromptu set-ups or RE power supplies. There are also some equipped laboratories at Princess Elisabeth for biologists. This range of support means that scientists can focus all their time and energy on research, rather than on the extreme challenge of survival, which they would face if they were working alone in Antarctica, one of the harshest and most remote environments on Earth. Over the 2017-2018 summer season, 24 scientists will be heading to Princess Elisabeth at different times to carry out research in and around the station. When they arrive in Cape Town, they must patiently await perfect weather conditions before making the long 6 hour journey over the Southern Ocean by Ilyushin 76 to land at the Russian air base Novolazarevskaya. They will then take a smaller plane (DC3 or Twin Otter) to reach Princess Elisabeth, nearly 200 km inland. Even before they arrive, the science has already begun, as some instruments are active throughout the winter. Others are reawakened and others are repaired. The upcoming season is a full one, with 15 Belgian and international scientific projects planned across a range of disciplines. Dr. Henri Roberts from the Royal Belgian Institute of Natural Sciences will carry out the first ever bird population assessment in the region, while Canadian scientist, Dr. Lori Ziolkowski is returning to the station to continue her research on microbial activity in Eastern Antarctica. This year there will be six Canadians at the Station, including two team members, two scientists and two technical consultants. We will also be welcoming scientists from Taiwan and Turkey for the first time. This year will also see the deployment of the 8th AWS (automatic weather station built by the University of Wisconsin) and it is our intention to provide all the data from the station on-line, in the spirit of the Antarctic Treaty. Much more is planned, so please stay tuned over the next four months. We will keep you up to date on the scientists, their work and all the other excitement that will be surely happening at Princess Elisabeth Antarctica!